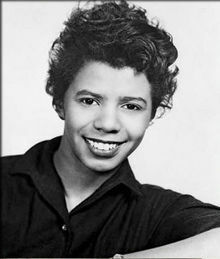 Lorraine Vivian Hansberry 3rd was born on May 19, 1930, in Chicago, Illinois. Hansberry’s father was a successful real estate broker, and her mother was a schoolteacher. Her parents contributed large sums of money to the NAACP and the Urban League. In 1938, Hansberry's family moved to a white neighborhood and was violently attacked by neighbors. They refused to move until a court ordered them to do so, and the case made it to the Supreme Court as Hansberry v. Lee, ruling restrictive covenants illegal. Hansberry met Robert Nemiroff, a Jewish songwriter, on a picket line, and the two were married in 1953. Hansberry and Nemiroff divorced in 1962, though they continued to work together. In 1964, the same year The Sign in Sidney Brustein’s Window opened, Hansberry was diagnosed with pancreatic cancer. She died on January, 1965 (age 34). After her death, Nemiroff adapted a collection of her writing and interviews in To Be Young, Gifted and Black, which opened off-Broadway at the Cherry Lane Theatre and ran for eight months.